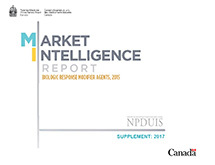 This document is a supplement to the PMPRB publication "Market Intelligence Report: Biologic Response Modifier Agents, 2015"Footnote 1 produced under the NPDUIS initiative. The supplement provides updated information for key market trends identified in the original report using data for 2016 and 2017. These trends, which are captured in the corresponding figures, represent only a subset of the results published in the original report. The methodology is in line with that of the original study, and the associated introductory material, limitations, overall conclusions, and disclaimers still apply. The results presented in this supplement follow the general interpretation provided in the original report. †France, Germany, Italy, Sweden, Switzerland, the United Kingdom, and the United States. Data source: MIDAS™ Database, prescription retail and hospital markets, 2010 to 2017, IQVIA. All rights reserved. In 2017, the uptake of the biosimilar for infliximab in Canada was still relatively low (2.7% of all infliximab use) compared with the average (35.2%) and median (32.9%) uptake across all OECD countries. *France, Germany, Italy, Sweden, Switzerland, the United Kingdom, and the United States. Data source: MIDAS™ Database, prescription retail and hospital markets, 2017, IQVIA. All rights reserved. Note: The OECD median for 2017 was originally reported as 35.2%. The text has subsequently been revised. 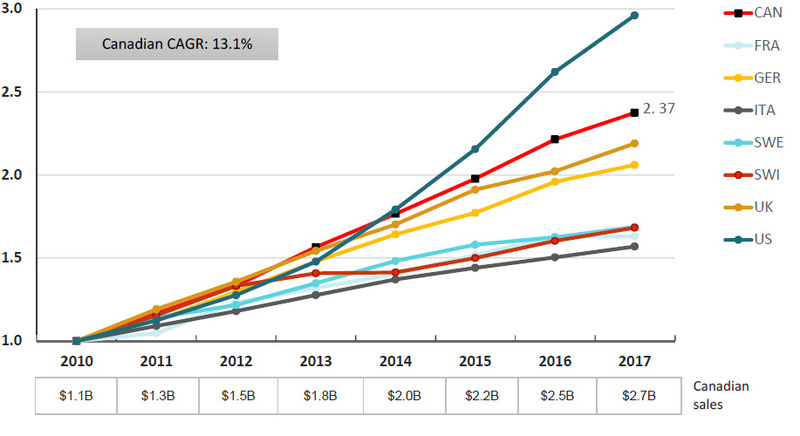 This series of graphs illustrates the trends in Canadian sales of biologic DMARDs, by drug product from 2010 to 2017. 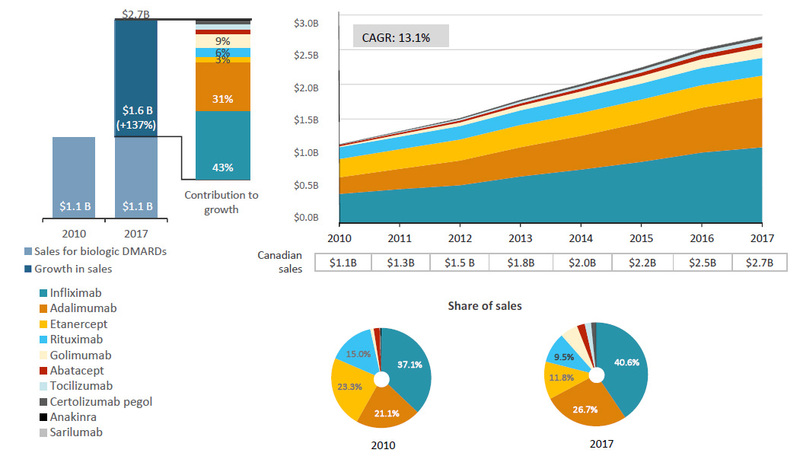 The two pie graphs below give the share of sales of each medicine in 2010 and 2017. 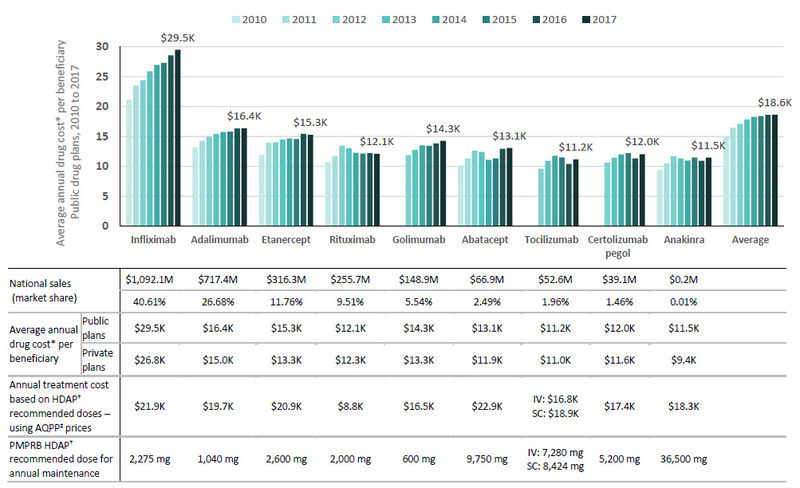 This bar graph gives the average annual treatment cost per beneficiary (excluding markup and dispensing costs) in public drug plans from 2010 to 2017. Treatment costs are given for each biologic DMARD and for the class average. *Includes drug cost and excludes markup and dispensing cost; the costs reported reflect the amounts what were accepted for reimbursement by the drug plans. †PMPRB Human Drug Advisory Panel. ‡Association Québécoise des pharmaciens propriétaires. Data source: Public drug plans: National Prescription Drug Utilization Information System Database, Canadian Institute for Health Information, 2010 to 2017. Private drug plans: IQVIA Private Pay Direct Drug Plan Database, 2010 to 2017. 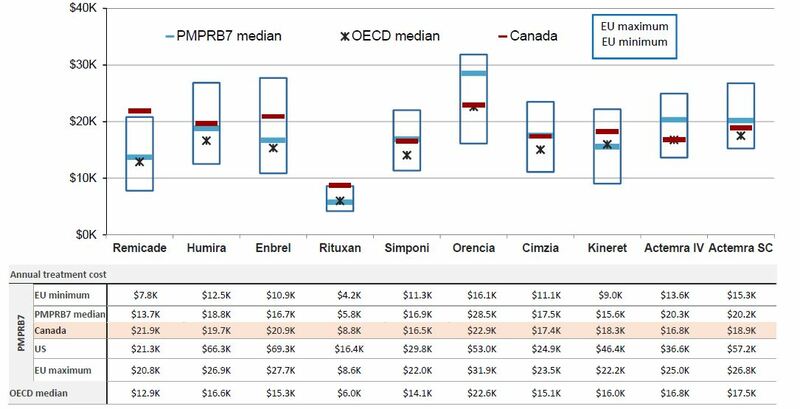 This bar graph gives the 2017 bilateral foreign-to-Canadian price ratios for biologic DMARDs for each of the PMPRB7 countries, as well as the multilateral foreign-to-Canadian price ratios for the PMPRB7 and Organisation for Economic Co-operation and Development median prices. Foreign prices are compared to the Canadian price level, which is set to one. France: 0.64; Germany: 0.93; Italy: 0.75; Sweden: 0.81; Switzerland: 1.01; United Kingdom: 0.65; United States: 1.70; PMPRB7 median: 0.82; Organisation for Economic Co-operation and Development median: 0.71. Data source: MIDAS™ Database, January–December 2017, IQVIA. All rights reserved. This graph gives the 2017 foreign-to-Canadian price ratios by biologic DMARD for the PMPRB7 and Organisation for Economic Co-operation and Development countries. The Canadian price (which is given in the table below the graph) is set to one and the international measures reported relative to this value. On the graph, the price ranges for the six European countries in the PMPRB7 are represented by rectangular boxes. 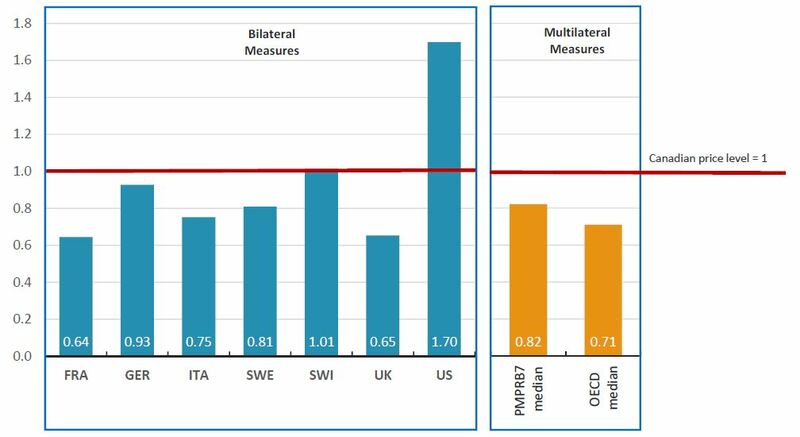 The median PMPRB7 price, the median Organisation for Economic Co-operation and Development price, and the average United States price are also reported. The 24% price differential between foreign and Canadian list prices for Remicade translates into $262 million in drug sales in Canada in 2017. Note: In Canada, Remicade infusions are almost exclusively delivered in manufacturer‐sponsored infusion centers, while in other countries the infusions are generally delivered in hospitals. This graph gives the 2017 annual treatment costs for biologic DMARDs for Canada, as well as the PMPRB7 and Organisation for Economic Co-operation and Development countries. The ranges in treatment costs for the six European countries in the PMPRB7 are represented by rectangular boxes. The average Canadian treatment cost, the median PMPRB7 cost, the median Organisation for Economic Co-operation and Development cost and the average United States treatment cost are also provided. Note: Annual doses are based on PMPRB Human Drug Advisory Panel (HDAP) recommendations. 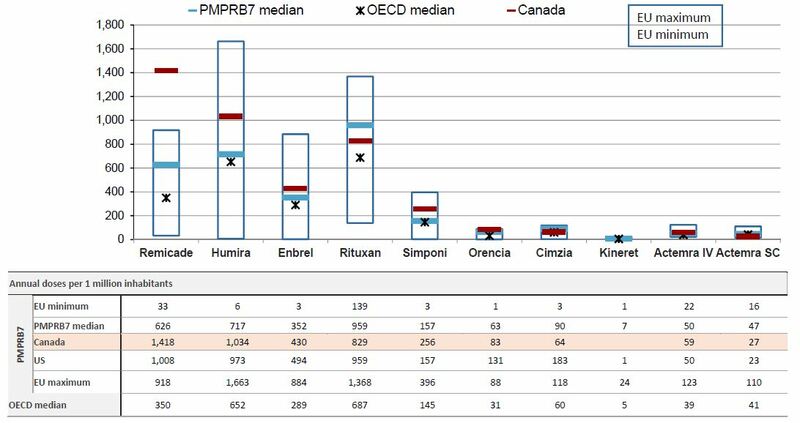 This graph compares the 2017 Canadian consumption rates for biologic DMARDs to the rates in the PMPRB7 countries. 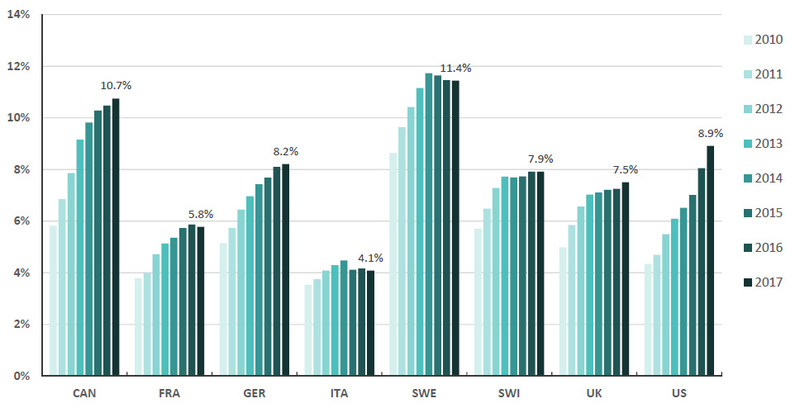 The ranges in consumption rates for the six European countries in the PMPRB7 are represented by rectangular boxes. The average Canadian, average United States and median PMPRB7 consumption rates are also given. Consumption rates are measured as the number of annual doses per one million inhabitants. *Based on the annual maintenance dose determined by the PMPRB Human Drug Advisory Panel and reported per one million inhabitants per year.